Do you use propane autogas to keep your North Carolina businesses running smoothly? If so, you’ve made the right choice for your wallet and our environment. Choosing autogas instead of other commercial fuels like on-road diesel, you are improving the air we breathe and the operation of vehicles. 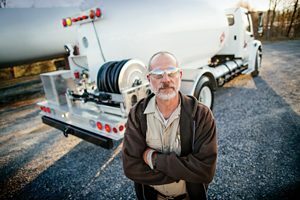 For these reasons, and more, Ormond Energy Co., Inc. is pleased to offer propane autogas to customers in our service area. Autogas is a liquefied petroleum gas used to power vehicles and other commercial machinery, including generators. Compared to other commonly used fuels for transportation vehicles, autogas is a leading clean-burning energy option that is produced domestically in the United States. This reduces CO2 exhaust and dependence on foreign energy sources. If you have a fleet of on-road vehicles that run on diesel, you know all too well the cost associated with keeping them on the go. Propane autogas is a more economical alternative in terms of price and operating efficiency. Not to mention that it is clean for the environment and each vehicles engine! If you use propane autogas for your business, you can rely on Ormond Energy to fuel your fleet. For more information, simply contact us here.